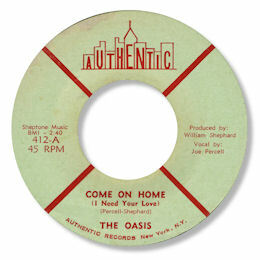 This Authentic 45 would seem to be the only 45 cut by this New York group – but Come On Home is a stunning deep soul disc. There’s a lovely mix of church and doo wop influences in the singing style and lead Joe Percell is outstanding in his delivery – super falsetto shrieks. The punchy horns and guitar fills sound just right. Another obscurity to treasure. Note ~ The Oasis on Zanzibar in the 80s would seem to be another group altogether.